After my early hands on at the MIPS photo show in Paris, I write hereafter my first review of the lens Micro-Nikkor AF-S VR 105 mm f/2,8 after one week of real use in the nature. The arrival of a new Micro-Nikkor lens is always a special event for me, specialized in butterflies photography. I was not pleased with the last AF version of the Micro-Nikkor 105 mm (poor bokeh at low magnification ratio and too much contrast). Therefore, up to now, I was still using my old AI-S 105 mm ... a 17 years old lens. optimized optical formula (one ED glass, NanoCrystal coat). Before this test, I was wondering how all these new features will impact my close-up results. My first remark is linked to the size of the lens. It is big, very big ! 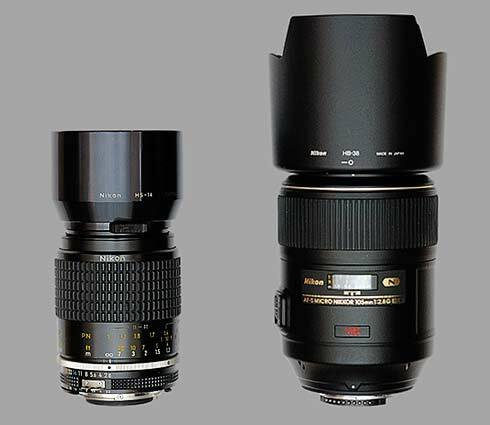 Compered to my old 105 mm AI-S, It looks like a longer telephoto lens (see below). But, after a couple of days in the nature, I must admit that the ergonomics is very good, with a large, smouth and very prcise focussing ring. The prcision of this focussing ring takes advantage of the large diameter of the lens. I also noticed, as a result of the IF fomula, that the actual focal length strongly decreases at high reproduction ratio. At the maximum reproduction ratio 1:1, the distance between the front element of the lens and the subjet is only 145 mm (5.7 inches) and less if the big hood is fixed onto the lens. The distance between the hood and the sujet à the reproduction ratio 1:1 is 70 mm (2.75 inches). When I use the lens in the nature, I discovered that this optical formula is an interesting compromize. At low reproduction ratio, the lens is a powerfull telephoto that allows long distance focussing perfect to shoot small animal and big insects like the butterflies. At high reproduction ratio, the working distance is shorter than with a conventional 105 mm and this helps to avoide motion blur. This new Micro-Nikkor is very versatile ! In another hand, the IF formula avoide any motion of the front element when the distance changes. This feature helps to fit securely the new macro lighting kit R1C1 in front of the lens. And you can add more SB-R200 units ; up to four. "With the enhanced VR system (VRII), photographers can capture sharp images at shutter speeds approximately 4 stops* slower [at near infinity to 3m (1/30x reproduction ratio)] than would otherwise be possible." As soon as I discovered the first results, I realized how usefull is the VR system for close-up photography. The percentage of photographs very sharp is simply higher. The VR makes to camera behaves as if a monopod was used. And even more when I activate the SWM motor in the same time in order to correct the small front-rear motions. With AFS and VR, the lens seems to have a 3D vibration reduction system ! But I must admit that I always used during this review a Nikon D2X equipped with the very sensitive MultiCAM 2000 AF sensor. The IF internal focussing formula avoide any motion of the front element of the lens and allows secure use of the R1C1 lighting kit. 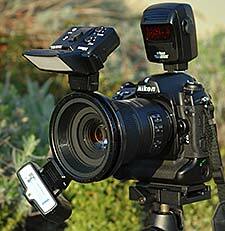 Used with a Nikon D2X, the lens deliver very sharp images. What is stunning is the regulatity of the results from f/2.8 to f/16 ! Then, the image quality is affected by the diffraction. And the sharpness of the images comes with another important result for my own style of close-ups : a wonderful bokeh. The lens produces perfect smouth background even when it is stopped down. At f/8 or f/11, transitions between out of focus areas are still very soft. When I use the lens wide open, my photographs take the advantages of high sharpness and magnificent bokek ! 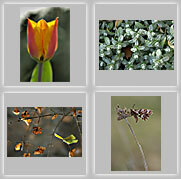 The image rendering is close to my needs and let me take nature pictures as they are in my mind. I love to play with sharpness and soft out of focus ereas with interesting bokeh. this new Micro-Nikkor AFS VR 105 mm f/2,8 is now one of my favourite Nikkor lenses just after the terrific VR 200 mm f/2. the image quality of the VR 105 mm is close to the one of the VR 200 : the reference ! Link to photographs taken with the VR 105 mm and the Nikon D2x. In the next pages, you can discover my first shots taken with the Micro-Nikkor AFS VR 105 mm f/2,8. Each photograph come with explainations and a 100% crop.